Today we only had two matches and they didn't start until the afternoon. That let us fix a problem we had with some cables on our lifter getting snagged, and let us have some time on the practice fields where we developed a new autonomous program to go to the far side of the field, mostly to try and mess up the other alliance, but with a chance to score too. Our first match was in alliance with Swerve 6220. In the autonomous mode our robot did manage to go interfere with the other team's robot. But the other alliance did manage to grab an early lead, and then played good defense to keep it, so we lost that match. 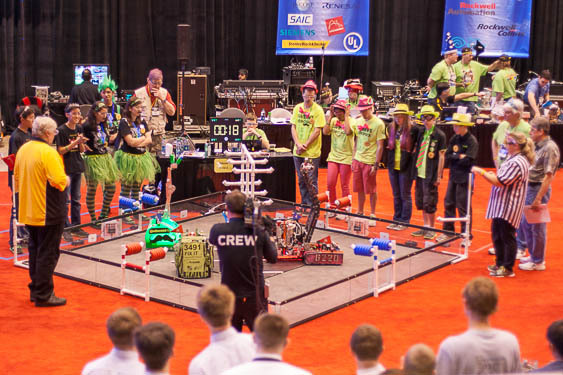 In our last match we were partnered with team 5843 Auto Vortex from Romania. Their robot had been held up customs in Europe. Another team loaned them a robot they used for practicing with and they borrowed parts from various teams including ours. They did really well at the tournament. Here we are setting up with them. We won our last match. Our final tally was five games won out of eight for 10 qualification points and 940 ranking points for a final ranking of 16 out of 64 teams. We're really pleased with our results. But we were disappointed not be selected for one of the final alliances. So we'll be going without our robot to watch the final games on Saturday morning. This page contains a single entry by Mike published on April 27, 2013 6:10 AM. St Louis 2013- Day Two was the previous entry in this blog. 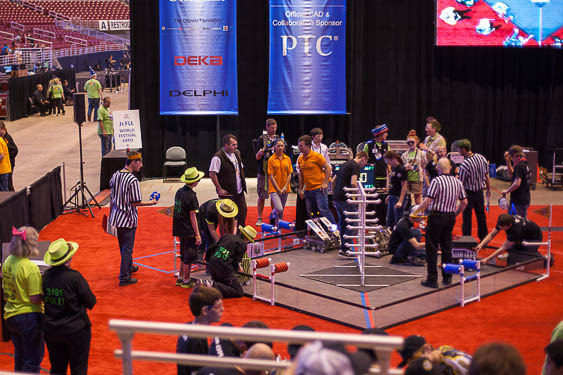 EV3 vs NXT is the next entry in this blog.